Physical Characteristics: 4.5 – 6.5 feet long, 26 – 38 inches tall, 57 – 170 lbs. Grizzled gray coat most common; can be coal black (most common in dense forests) to creamy white (characteristic of the high Arctic). Ears are short, more rounded than coyote; muzzle is short, wide, and blocky. Runs with bushy tail straight out; overall level (direction) of tail generally relates to social status of individual. Diet: Large mammals comprise 80% of diet, mostly cervids (deer, elk, moose, caribou) and Bighorn Sheep. Usually hunts in family groups; also eats rabbits, mice, nesting birds, and carrion when available. Will eat sweet grasses, berries and nuts. May kill unguarded cattle, sheep, goats, horses, dogs, cats and pigs. Adults can eat 20lbs. of meat in a single meal. Wolves do not take down big mammals like buffalo, moose or musk oxen very often. Hunting is dangerous for wolves. Bodily injury or death can occur during hunt. Habitat: Formerly occupied grasslands, forest, deserts, and tundra; today mostly restricted to forests, streamside woodlands, and arctic tundra. Dens are usually located on rise of land near water; most are bank burrows, often made by enlarging den of a fox or burrowing mammal. Rockslide, hollow log, or natural cave may also be used. Sand or soil scratched out of entrance by female wolf is usually evident. Range: Historic range covered two-thirds of U.S. Current populations in Michigan, Minnesota, Wisconsin, Montana, Idaho, Wyoming, Oregon, Washington, California and Alaska. Territories can range from 50 – 1,000 square miles. 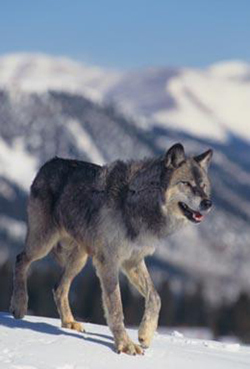 Attempts made to recover wolves in Idaho and Yellowstone National Park in 1990s, despite species being present in low numbers in western Montana and North Central Idaho. Reproduction: Typically mate for life. Breed from late January – March; pregnant for approximately 60 days. Give birth to approximately 4 – 6 pups (weaned about six weeks and fed regurgitated food by adults until old enough to participate in hunt). Mother moves den every few months until choosing to leave den site. Families usually range from 4 – 9 individuals. Social hierarchy is strictly followed; “alpha” male and female are usually only individuals to reproduce. Other individuals help feed pups, watch pups and defend families territory from neighboring wolves. Lifespan in wild averages 8 years. Threats: Northern Rockies Gray wolf population prematurely stripped of protections afforded under Endangered Species Act via legislative rider by Congress in 2011. Idaho, Montana, Wyoming and eastern portions of Washington and Oregon inherited management, resulting in thousands of wolves being killed via hunting, trapping/snaring and aerial gunning. Miscellaneous: Capable of many facial expressions – pursed lips, smile-like submissive grins, upturned muzzles, wrinkled foreheads, squinted eyes, etc. May stick out tongue as gesture of appeasement or submission. Will also bark (warning) and howl to communicate with other individuals or neighboring families. Body language, scent marking, and growling are other modes of communication that serve to reinforce social hierarchy.